Call or stop in today for a tour and contract information. A multi-service facility for the boater: 154 wet slips, electric and water at slips, floating docks, transient dockage, 58-rack storage, winter storage available, gasoline sales at fuel dock, 15-Ton Acme Marina Hoist, and 15-ton forklift. 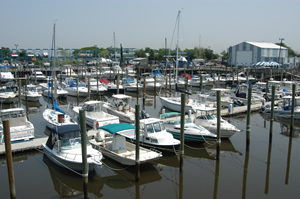 The 10-acre Monmouth Cove Marina was purchased by Monmouth County in 1990 to help satisfy the increasing demand for boating facilities. Monmouth Cove Marina is part of Bayshore Waterfront Park which offers recreational opportunities in the Bayshore. No restrictions to Bay or Ocean. Convenient to New York City and just ten minutes to Sandy Hook. See our May 2018-April 2019 fees | May 2019-April 2020 fees. Hwy. 36 in Middletown to Main St., Port Monmouth. Follow Main St. to Wilson Ave., turn left and continue to end. Turn left onto Port Monmouth Rd. Follow Port Monmouth Rd. to Marina on right.